Cimalgex There are 3 products. Cimalgex Chewable Tablets for Dogs are for the treatment of pain and inflammation associated with osteoarthritis, and the management of peri-operative pain due to orthopaedic or soft tissue surgery, in dogs. 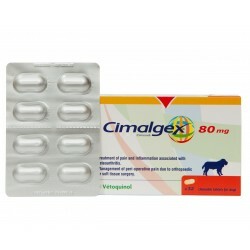 Cimalgex is a non-steroidal anti-inflammatory drug used in the treatment of canine arthritis, and in some cases, in the short-term management of post-operative pain. Cimalgex is distributed in the UK by Vetoquinol UK Ltd., and contains the active ingredient Cimicoxib. 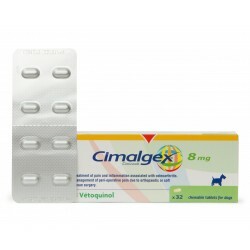 Cimalgex is one of a range of NSAIDs that are widely used in veterinary practice as part of the treatment protocols to manage arthritis, and the effects that this can have upon the dog. Cimalgex has anti-inflammatory, analgesic and antipyretic properties, meaning that it helps to reduce the inflammation, pain and swelling that commonly accompany arthritic flare ups. Cimalgex can also be used on a short term basis to manage pain as part of recovery from surgical procedures. Why might my dog be prescribed Cimalgex? If your dog is diagnosed with arthritis, your vet will work with you to develop an inclusive care protocol to make your dog as comfortable as possible, improve their quality of life, and increase their range of movement. Dog arthritis causes pain, swelling and inflammation within the affected joints, all of which can make your dog stiff and uncomfortable, as well as causing chronic or acute pain that can make your dog reluctant to move or exercise. As dog arthritis is exacerbated by joint stiffness and lack of movement, this can serve to make the pain and other symptoms worse, and so the treatment and management of arthritis depends upon easing your dog's symptoms, and allowing them to lead as normal a life as possible. A combination of weight management, a suitable exercise routine, medications and possibly physical therapy are usually used for dogs with arthritis, and NSAIDs are an important part of helping to ease the pain and restore comfortable movement to your dog. Cimalgex contains the active ingredient Cimicoxib, which is a selective COX-2 inhibitor. Cox-2 is one of the body’s two coxib channels, along with Cox-1. The inflammation, and so, associated pain and discomfort of arthritis occur in the Cox-2 pathways, and so NSAIDS work by blocking these pathways off, to reduce the inflammation and associated pain. Some forms of NSAIDs are non-selective, and also block the Cox-1 pathways, which form compounds that help to protect the stomach and kidneys. This is part of the reason why some nonselective NSAIDs are poorly tolerated by some dogs, leading to gastrointestinal upsets. As a selective Cox-2 inhibitor, Cimalgex helps to protect the kidneys and gastrointestinal tract, greatly reducing the chances of digestive side effects or damage to the kidneys as a result. Cimalgex comes in tablet form, which is administered orally once per day. The tablets are palatable and so should be well received by most dogs, and are scored, so the tablets can be divided up into smaller doses if needed.Cimalgex can be given either with or without food, and is available in various different sizes to suit the needs of different dogs. For dogs treated with Cimalgex for osteoarthritis, usage should be reviewed after the initial six months. If the medication has proven to be effective during the initial six month period, treatment may be continued. However, monitoring of the functionality of the liver and kidneys is advised when Cimalgex is used long term, as the long term use of NSAIDs may potentially have a detrimental effect on healthy liver and kidney function. Are there any side effects with Cimalgex? • Potential risk of gastrointestinal upsets such as vomiting and diarrhoea. • Loss of appetite or refusing to eat. • Long term use of Cimalgex may potentially impair kidney function, and so dogs prescribed Cimalgex long term should be monitored for any changes. • Overdose with Cimalgex may cause acute kidney or stomach symptoms, which will require urgent veterinary attention. • Special care should be taken when treating dogs with heart or liver diseases with Cimalgex. How can I get Cimalgex for my dog? 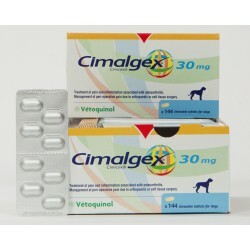 Cimalgex is a POM-V medication, which means that it can only be purchased with a veterinary prescription. Your vet will discuss the various treatment options for your dog with you, and if they agree that Cimalgex is the best choice for your pet, they will issue you with a prescription for the product. You can use the prescription to order the medication from us.